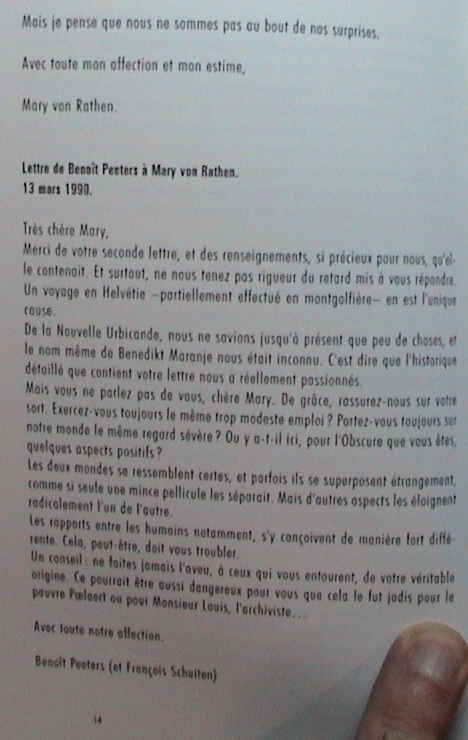 Towards the end of January 2003, I received from Benoît Peeters an e-mail that ended in a rather strange manner. had read this message at the office, during the day. Not having seen the book he was refering to, I was prepared to send a negative answer to Benoît when I returned home. As soon as I had crossed the door, I was surprised to discover that a book had indeed been left in my mailbox while I was away. No stamp, no wrapping. Just a card slipped between two pages, bearing only the words: “To Sylvain St-Pierre”. 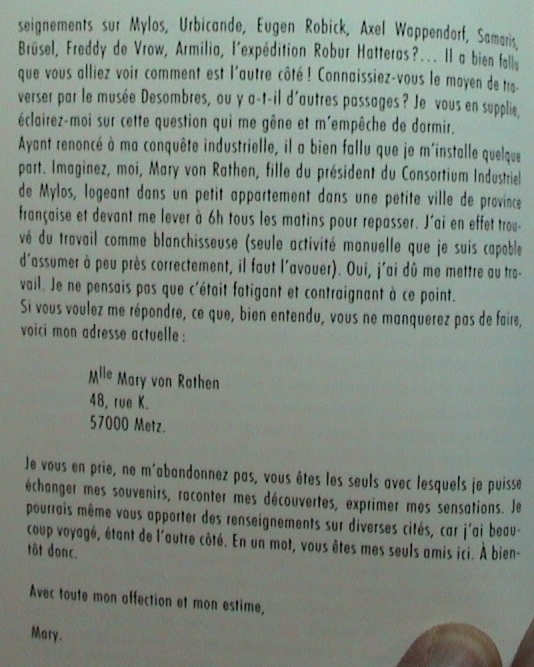 A quick browsing through the book, entitled Correspondances, revealed it to be a compilation of the exchanges made over the years between the Authors and a person presenting herself as Mary Von Rathen. Any fan of the Obscure Cities series worth his salt knows about the existence of those letters, and it is further said that the Authors have long suspected each others of having written them. To this day, several details contained therein have worked their way into the series, mainly in the hard cover versions of the Guide to the Cities. I do beleive in coincidences, but this one was rather too great for comfort and I mentionned to Benoît that he was in my eyes a prime suspect. He swore that neither he nor François was the author of this book. It was easy enough to beleive him, as I became myself a suspect when I spread the word amongst my fellow obscurophiles! Speculations started to spread at the speed of a galloping bunyip. Even better: a few days later, our friend Olivier Tissot told me that he had also received a copy of the mysterious book. In in case, the things was delivered at his office, the address of which is not widely known. As an added amazing coincidence, he was at that very moment deep in a phone conversation with Alex Willem, another well known obscurophile! It took nothing else for Olivier to join, much to his reluctance, the club of suspects. Several hypothesis have been raised so far regarding the true origin of this book. While some of them are somewhat silly, not to say downright wacky, others are worthy of further examination. The only thing I am absolutely certain of is that I am in no way connected to this plot. I am however aware that convincing others of this may be difficult, hence this, which I will try to make as exhaustive and impartial as possible. Being a Canadian, I follow the British rule of law: any accused is innocent until proven guilty! The eight known copies of Correspondances were delivered in five distinct stages, all of them under mysterious circumstances. January 24, 2003 [around 7:00 PM]: Angoulême, France - François and Benoît each received their copy from the hands of a young woman described by Peeters as being “brown-haired, pretty, about 25 years old”, who popped out of the crowd after a presentation in Angoulême within the frame of that city's 30th Comic Strip Festival. 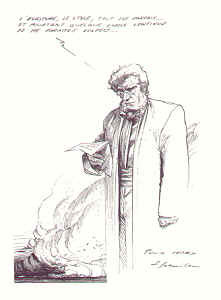 Since François Schuiten was the president for that year, his presence was pretty much a sure thing; but he was at that moment at the other end of the stage and apparently did not notice the exchange. After only a few words, the unknown person melted away in the crowd as suddenly as she had appeared. January 29, 2003: Laval, Québec, Canada - My own copy of Correspondances was, as previously mentionned, deposited anonymously in my mailbox a few hours after Benoît Peeters had told me to expect something like that. I was less surprised that time than when I received the “Testament”. Although I am still not in the phonebook, my address is now known by several obscurophiles. But it was not so at the time of the first delivery, and I am still wondering how it was done! It so happened that my mother was home on that day, and she saw through the window that it was a man - who came in by car - that left the documents. Thinking that it must have been a distribution of advertising stuff, she unfortunately did not pay much attention to details. February 4, 2003: Paris, France - The way Olivier received his own copy is one of the strangest of all. He was chatting on the phone with Alex Willem, a well known obscurologist and webmaster of the Site of Passages, when his secretary was handed a package addressed to his name. While several of us have Olivier's home address, the one for his workplace is not public knowledge. Finding it is not an impossible task, but demonstrates how far the plotmaster in this story is ready to go in order to maintain an aura of mystery. Olivier's copy was delivered, according to the secretary's description, by a young woman “who looked like a student”. She presented herself as being Italian. “I cannot tell where this is coming from” were about her only words, but she apparently knew very little French and spoke English with a foreign accent. This last detail was mentionned to Benoît Peeters, who replied that he did not notice anything of the kind about his own delivery girl. It is of course possible that it may have been faked to muddle her tracks. I had already notified at time both Alex and Olivier of the existence of this mysterious book. I am not privy to the exact content of their conversation, but we can - without much risk of being proven wrong - suppose that it must have taken a most interesting turn immediately following the delivery of the parcel… At the very least, Alex confirms that Olivier's surprise seemed quite genuine. It must have been Sunday February 23; I was coming back from hiking in the forest and was removing my walking shoes in my garage. It was dark (about 6:30 PM) and an unknown lady, young (25 years old at most, it seemed to me) asked me if I was Eddy REMY. She then gave me this book. She quickly turned away and stepped into a car, in the front passenger seat; she was not driving the vehicle, which I did not identify (neither the make or colour, because of the darkness!). 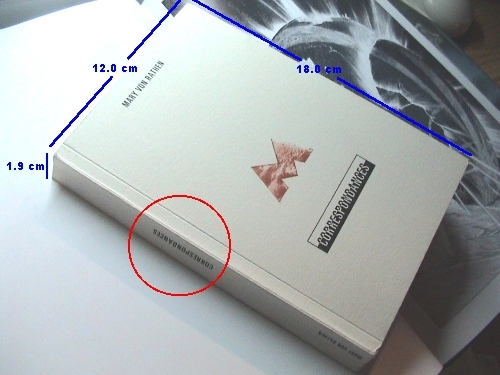 he book measures exactly 18 centimeters in height, 12 centimeters in width and 1.9 centimeter in thickness. It is therefore a metric production, which tends to favour a european origin. Regarding the height, several printing houses produce books in this size, and I found more than one in my own collection. The width, however, is unusual. It seems that the universally accepted standard today is 11 centimeters, and I had to dig a book printed in 1965 to find one that matched. As additional information, Canada converted to the metric system about thirty years ago but, because of the dominance of the american market, still uses imperial measures for printing jobs. This should lighten somewhat the burden of suspicion weighting on my own shoulders. The title on the spine of the book follows the convention used in France and Romande Switzerland, meaning that the laid lenghtwise is upside-down when the cove faces up. Books printed in french in Belgium and Quebec follow the anglo-saxon rule, which is reverse. This should eliminate the Authors, Alex Willem and all other belgian residents - as well as myself - from the suspects list. Of course, cynics will claim that we may all have had a sufficiently twisted mind to have thought about this detail and purposely gone against the usual rule in order to cover our tracks. I can only answer to this that a French origin for the book would be in perfect accordance with the provenance of the original letters, which were mailed from the city of Mets. The large dappled red “M” in the middle of the cover is immediatly noticable. If we compare Olivier's copy and mine, we notice undeniable differences in the details. The only valid conclusion is that this element was added separately, probably by hand with a rubber stamp. That of Olivier. The apparent difference in tint is due to the scanning process. The originals have the same colour. It so happen that one of the very first letters of “Mary” mentions that one of the few objects that “passed” with her in out world is a seal that she uses to sign official documents in Mylos. We certainly cannot accuse the author to be lacking in consistance! Although mentionning this may rekindle suspicions about myself, I must specify that to produce such a seal is not difficult at all. 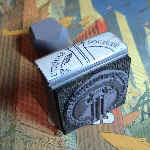 Working together with a group of obscurophiles on BDParadisio, I had fifteen copies of a rubber stamp made to order by a local company specialised in this kind of work. In the case of this “M”, it could even have been bought as is in a store. In fact, the design is so simple that it could also have been easily enough made by an amateur using a minimum of skill with a blade and a piece of rubber. If it is the original mentionned in the letters, then it would be about ten years old and close to being a collector's item. A check made with Benoît Peeters revealed that this same seal was also used on the back of several of the letters he himself received. This work has been printed on the Presses de la Cour in Porrentruy in 771. All right reserved for all Cities, including Sodrovno-Voldachia & Calvani. The pictures that grace the inner pages of Correspondances are interesting in many ways. They are, except for one, the same that came with the “Testament”. Those images, that I had scanned before sending the originals to Benoît Peeters, are displayed in this Dictionary, in the relevant dossier. I even thought for a moment that the author of the book might have found them there, for it would not have been impossible for the writer of the letters to claim the work of other anonymous contributors and combine all works in a single volume. This dark hypothesis crumbles upon close examination. There are small details that indicate that if indeed the reproduction have been made from the same originals, they must have been made separately. This is most evident for the illustration on page 138. It represents the Laetitia, an enormous vehicle on board which Mary and de Malegarde are said to have crossed a great part of the Continent. In Correspondances, we notice that the lower left corner bears a light shadow which is not present on the copy I made. This kind of defect is characteristic of what happens when the document is not perfectly flat when it is being reproduced; either on a scanner plate or in front of a camera. The very subject of this particular illustration is in fact worthy of interest. 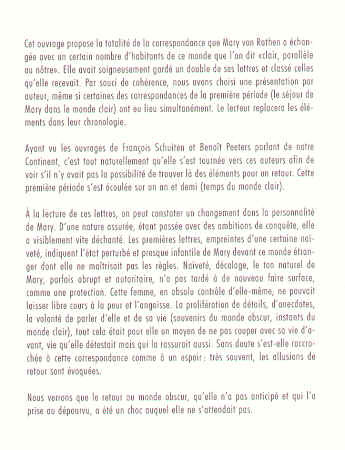 When I received the “Testament”, the section about “Mary's Mail” had already been on line for some time as part of the urbicande.be Web site, and therefore available to all. Not having at the time any other reference regarding the “Mail”, I had concluded that an anonymous obscurophiel, probably a Quebecer, had used the source material published by the Authors to write his or her own chapter to the story. In the light of the recent events, this conclusion now seems an erroneous one, and must be revised. The Laetitia of the book is very much in accordance with the one presented in the short film sent through the Internet to the Authors with the “scriptophonic messages”. Care was even taken to depict the two smokestacks, something wich is very difficult to pick up from the film. 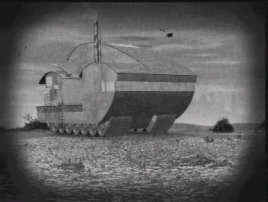 Morever, the vehicle is showed from a completely different angle, and the artist probably worked from a model, either an actual or a virtual one. It is in fact hard to say if we are faced with a miniature or a computer rendering, such being the quality of the work. One would almost think that the movie has indeed been shot on location! Another detail: the upper portion of all the illustration sheets joined to the “Testament” had been diagonaly ripped out. In fact, I scanned those images on a black background to emphasize this characteristic. No telletale mark appears on the drawings reproduced in Correspondances. Such markings can easily be corrected by various means, but a person willing to go through the trouble would also have erased the shadow mentionned above. I therefore conclude that the reproductions have been made before the originals were ripped and deposited in my mailbox. If I underscore this point, it is to dispel the notion that the book may have been concocted by Benoît Peeters from elements truly received in an anonymous manner over the years. Suspicious minds will of course point out that it is very possible that Benoît, uncertain of how I would use them, may have made those copies before sending the originals to me through devious means. Again, the writer of the Obscure Cities swears that such is not the case. The book itself has been printed with normal-looking characters, but we have able to study three specimens of handwriting directly connected to the copies of Correspondances in our hands. They are all very short, but nevertheless revealing. 1 - The Numbering. Each book is individually numbered. The Authors, Olivier, Jérôme and myself have received, in order, copies 1/25, 2/25, 12/25, 18/25 and 25/25. Those numbers are written in pencil on the title page, in a hand so fluid that I first mistook them for a signature. 2 - The Wrapping of Olivier's Book. The copy delivered to Olivier Tissot was wrapped in a sheet of paper on which was written “O. TISSOT” in capital letters. There is no doubt that the handwriting is the same as for the numbering. 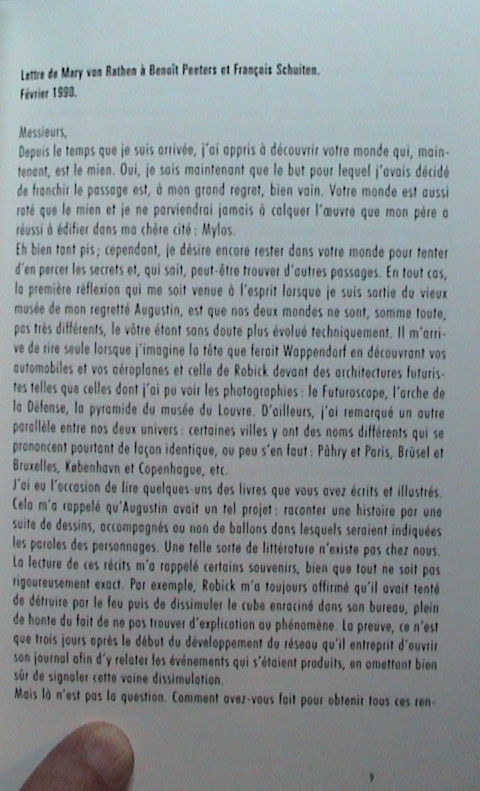 3 - The Card in Sylvain's Book. 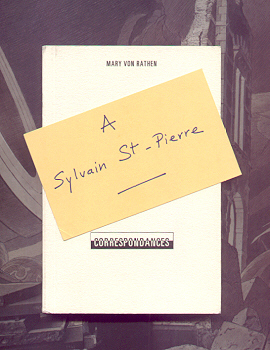 My own copy was not wrapped, but a card bearing the words “A [to] SYLVAIN ST-PIERRE” was slipped between two pages. One can see at first glance that the hand is different than either the numbering or Olivier's name on the wrapping. An interesting detail: my name has been written in the manner used in Quebec, that is with the “St” abreviation. However, the european style (“Saint”) was used in the short text introducing the chapter of the book devoted to the Testament of Mary. 4 - The “Testament”. This equaly mysterious document is in fact the only other comparison point for the handwriting. If it was found that the style of “Monsieur de Malegarde” is identical to that of “Mary”, then we would have a definite proof that this is all a scam. Unfortunately, I cannot claim for sure that this is the case. There may be some similarity between the “O. TISSOT” and the text of the “Testament”, but only a graphologist - and I am not one - could tell for sure with so few letters to compare. Personnaly, I think that we are faced with two different styles. One thing though is certain: Benoît Peeters confirms that the handwriting of the “Testament” is indeed that same as the one on the handwritten letters he still has. The book`s introduction explain in a clear and concise manner the nature and origin of the content, which is remarkably well structured. 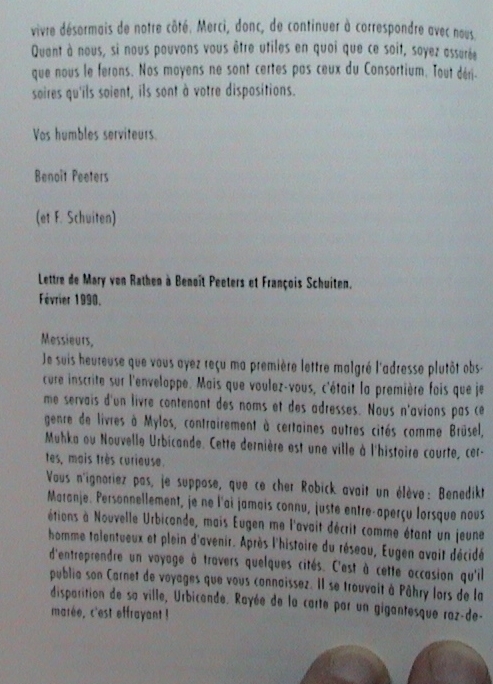 Benoît Peeters confirms that the letters attributed to him do indeed match those that he has written. To maintain such a degree of coherence over more than a decade is a considerable tour de force, and the author is certainly worthy of our admiration! The letters reproduced in Correspondances are, in my opinion, a very rich source of information on the Obscure World. Obviously Schuiten and Peeters must think the same, for they have used several excerpts as source material. Thus, the establishment of the nine to one temporal relationship between the Light and Obscure Worlds seems to have originated in those letters. Likewise the Seven Days of Mylos, the religious vocation of Gorona and other such details. Page 21 - April 1990 AD. Le Mystère d'Urbicande has been printed as a joke by a group of students from Brüsel. Regis de Brock does not exist, and the Dean of the Faculté des Sciences at the time, whose name Mary does not recall, was a 90 years old man who protested vehemently. Robick apparently gladly supplied his help for the mystification. 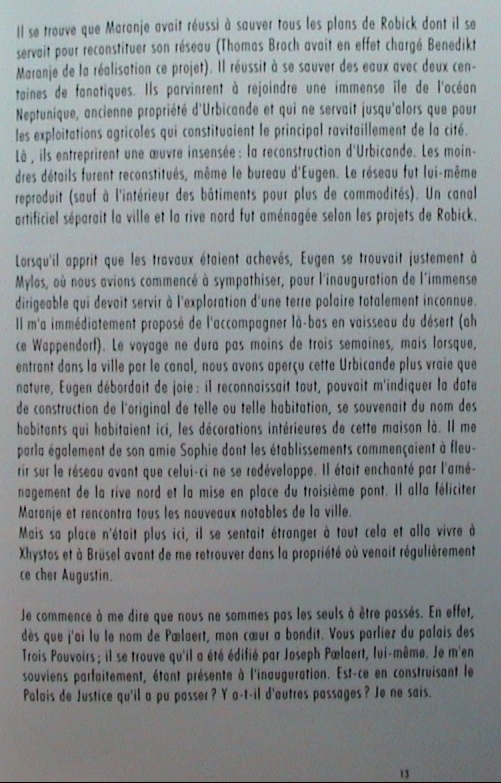 Page 26 - May 1990 AD. Mary tried to have her picture taken during her stay in our world, but her face never managed to leave an imprint on the film. Page 28 - May 1990 AD. Precisions are given about the calendars of several Obscure Cities. In most cases, we do not know the true origins of each city, and important historical events are used as the basis for Year Zero. In New Urbicande, which uses the second growth spur of the Network as its starting point, the current is 17. Xhystos starts with the creation of its Council, 371 years ago. Pâhry officially begun with the construction of the first bridge between its two banks and is now in 1985. Mylos celebrates its new year on September 28 to commemorate the day when a mysterious white ball saved the original village from a violent thunderstorm, 4037 years ago. Alaxis wins the trophy, with a calendar that goes back a wooping 10,107 years. Page 31 - July 1990 AD. In Mylos, all birthdays are celebrated on the same day of the year. Mary was therefore not quite sure of her exact birth date. Page 67 - June 10, 1991 AD. It is actually one of Mary's administrators who came to our world to take her back. A gentleman named Søren Absalón is said to have discoved, in the ruins of the Obscure City of Kaloyski, a Passage opening in Cuzco, in Peru. Page 114 - October 24, 1996 AD. 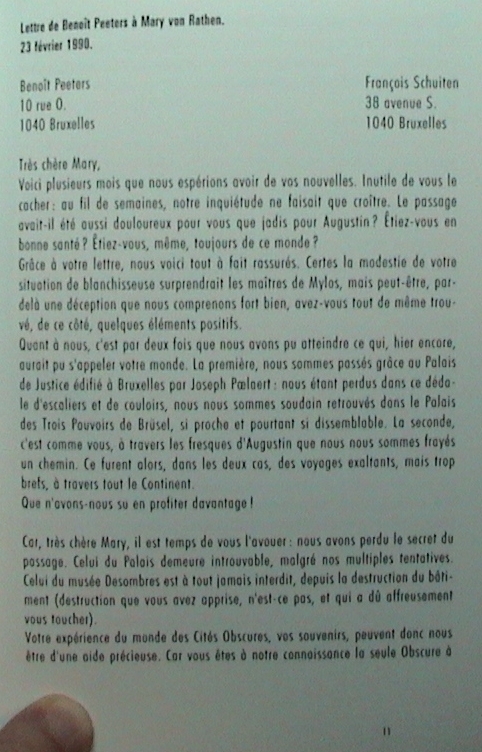 Mary apparently was a witness of the famous episode where the lights went off in Montreuil, but from the Obscure point of view, after she returned on the Continent. It would have been a brief contact between the two worlds. Page 151 - February 16, 770 AT. The Obscure City of Pâhry is criss-crossed with secret corridors, from the deepest basements to the highest attics, all of them linked to each others. This network is said to have been built durint the regularisation of the city, in part for defensive purposes, but also to insure control over the population by the Authorities. These dusty corridors are kept secret from ordinary people, but Roman de Malegarde knows some access points. Page 169 - February 28, 770 AT. A gigantic fault opened in the vicinity of Blossfeldtstad, going on for a great distance to the south-west up to a Minor City named Rozenn. This analysis would not be complete if we did not mention, as a capping piece, the presence of a particularly unsettling element. It is the very name of the person who claim to have compiled Correspondances: Roman de Malegarde. This family name is attached to a small village in France, formerly defended by an old castle, where Benoît Peeters has been spending his vacations for many years now. A detail which, like some of our addressed, was known to only a few people… It should however be noted that Benoît did not, as he mentions in one of his letters, discover a hidden tunnel there when he was twelve. There we are, I have presented for your perusal all the pieces of the puzzle that I happen to have. You know as much as I do, if not more. Perhaps will we know more when the seventeen remaining copies have been found. I leave you to draw your own conclusions, but nevertheless wish to add a personnal opinion. We are here faced with a gigantic sum of work. The letters, the messages, the movie, the book, the way everything has been delivered, the many small personnal details that crisscross each others over and over again; all of this is stunning and tantamount to madness. That a single person might have mounted such a mystification and maintain it flawlessly for so long is barely more credible, I think, than the alternative. For of course, we cannot discard the craziest hypothesis of them all. Should we ignore it, somebody else would no doubt raise it, with probably not as much objectivity in the analysis. To reproduce the content of Correspondances presented a double problem: the size of the work, 195 pages; and the type of binding used, which make it impossible - except for the very first pages - to lay the book flat on a scanner with damage. I have thus been force to use frame grabbing, aiming a digital video camera at the pages with on hand while keeping the book open with the other. The result is sadly distorted, and my fingers can often be seen, but it is the best I can do at the time. It is out of the question to grab the whole of the book in this manner, but I do expect to be able to add significant excerpts over time. I may eventually supply translations into English as well, but I ask your patience over that last promise.